We are a non-profit, non-religious, non-political, non-government organization who links international volunteers with Nepali people. We wish to enrich and improve the lives of both the local people and volunteers by providing new and memorable adventures and experiences. We are working for many different placement and placement are based in Community. we are established to link international volunteers with Nepali people in an attempt to enrich and improve the lives of Nepali people and provide a new and memorable adventure for volunteers. Our mission is to create and develop a range of dynamic opportunities that would best benefit each volunteer as well as addressing the needs of Nepalese communities. And to empower marginalized communities through enhanced education, health and income generation under women empowerment, children development, youth empowerment and public health programs with special focus on women and children by conducting training and research, developing basic infrastructure, mobilizing skilled local and international volunteer to promote equality, economic well being and basic human right.We can also arrange for you to go trekking in the Himalayas, white water rafting, or on a jungle safari in Chitwan National Park. Perhaps you would like to explore Hindu temples and Buddhist stupa in Kathmandu as a part of your volunteering experience. 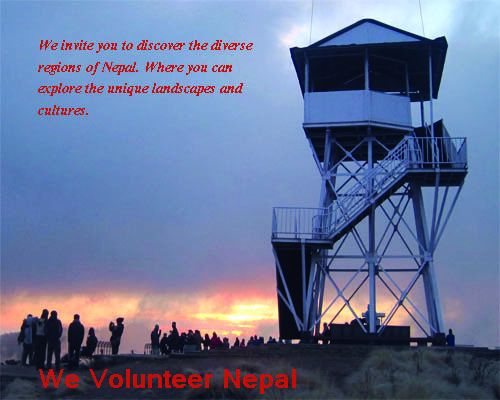 We offer the chance for our volunteers to contribute their skills and gain the experience of what Nepal has to offer. Why volunteer with We Volunteer Nepal? * Our Team in Nepal is all Nepali people,so we are completely committed to helping our community and we invite you to join is in making a change for Nepal. * Promote community development without destroying traditional ways of life. * To provide education and training for community youths to encourage and create opportunity for self-employment. * To provide language lessons and cultural information for people who come to Nepal to study, conduct research and do voluntary work. * To introduce volunteers to the richness of nepali culture and ensure a safe and memorable stay in a supportive environment. * With We Volunteer Nepal you know for a fact that your money is going towards helping the community. * Our program run all the year round so we are extremely flexible for your plans. We also accept people traveling alone or in a large group.